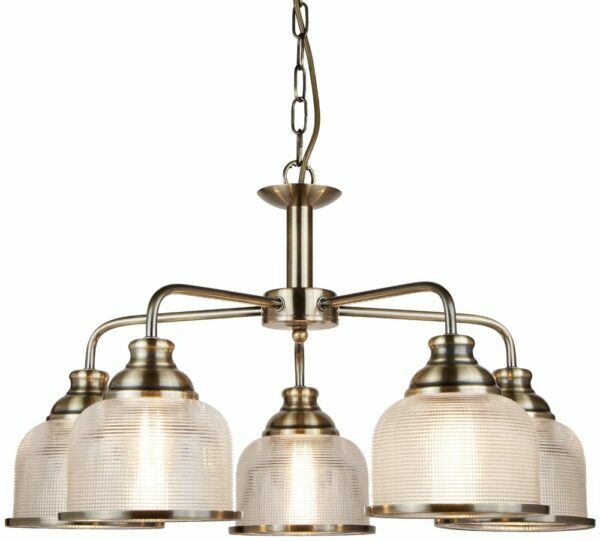 This Bistro II antique brass finish 5 light chandelier with retro style Holophane glass shades has vintage chic and modern practicality. 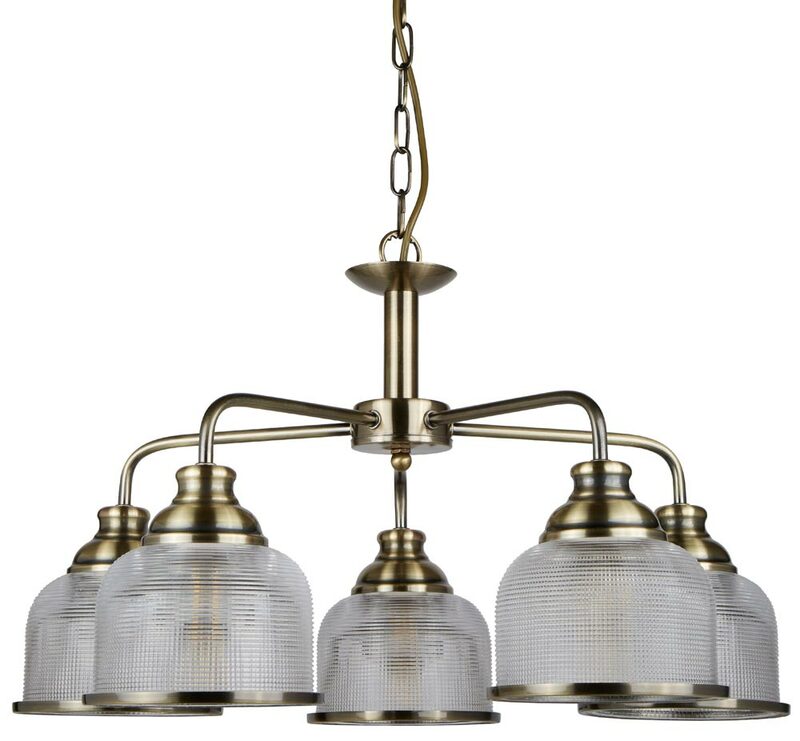 Featuring a circular ceiling cup, chain suspension and central rod, with five curved arms, large spun shade fitters and downward facing Holophane glass shades finished with antique brass trim. Holophane glass was first manufactured in 1906 and is made from cast borosilicate glass. Small glass prisms are embedded within it, which refract the light and provide a combination of up and down light to illuminate any environment evenly without creating any dark spots or glare. This attractive chandelier makes an impact in any environment with its striking combination of antique brass and Holophane glass. The suspension chain leads to the frame and the downward facing glass shades create a warming glow to brighten your dining room, hallway, lounge, bedroom or kitchen. Height adjustable at the time of fitting by removing chain links to achieve the perfect drop, please see below for dimensions. 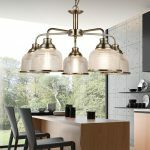 There are matching fittings available in the Bistro II antique brass finish lighting range that includes a single pendant, two and three-light pendant bars, a three-light chandelier and single switched wall light; please see below. Also available finished in satin silver. This retro style light is supplied by Searchlight who manufacture some of the best traditional and modern classic designs such as the Bistro II antique brass finish 5 light chandelier with retro style Holophane glass shades you see here.